Coral Sea Resort, in the exclusive sea side enclave of Airlie Beach, positioned on paradise point, is an oasis of luxury and tranquillity just moments via seaside boardwalk to Abel Point Marina or the enchanting Airlie Beach resort village that abounds with shops, restaurants and entertainment venues. This deluxe award winning resort is situated just 30 minutes from two major domestic airports or 25 minutes from the national highway. Externally, this low-rise four-storey tropical resort is adorned in Mediterranean architecture with expansive balconies, arches, columns surrounded by lush tropical resort gardens. Inside, the resort is cool and elegant with a largely nautical influence featuring tiled lounges and sumptuous cane furnishings. Coral Sea Resort features a variety of rooms including luxury suites, apartments, beach houses and penthouses. Offering an enticing array of facilities including award winning seaside restaurant, private dining oceanfront gazebo, cocktail lounge, fitness room, disabled and lift access, beauty centre, hair salon, massage facilities, private Jetty, water sports, two outdoor pools, wedding chapel, resort shopping and tour booking agency. The resort has an extensive array of conference, meeting and wedding facilities that feature picturesque ocean views for up to 300 guests. 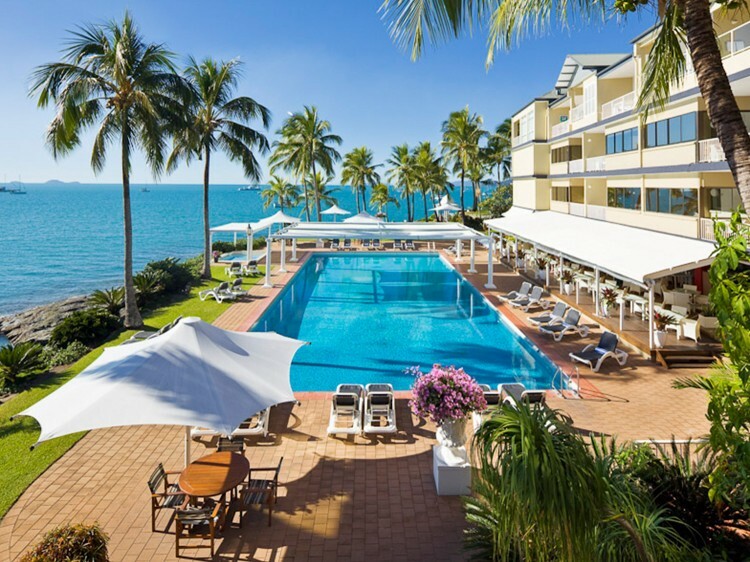 Combining first class facilities with award winning legendary hospitality, Coral Sea Resort rates as one of the most appealing deluxe luxury resorts in the magical Whitsundays. Clipper Restaurant & Bar - offers al fresco dining all day, from breakfast through to dinner. Specialising in fresh local seafood, and steak, the poolside location offers unrestricted views of the Coral Sea and Whitsunday Islands, making it the most spectacular of all Airlie Beach restaurants. Gazebo - intimate dining for up to 6 guests in the privacy of the resort’s oceanfront Gazebo. Enjoy a candlelit dinner whilst you gaze across moonlight pioneer bay, whilst the gentle waves caress your oceanfront location at the waters edge. A private butler is available to ensure your every delight is attended to. Poolside - a poolside outdoor venue is also available for more casual barbecue style or formal dinners. Powerful spot lights illuminate the lawns at night. The Jetty - the private jetty is a wonderful location for a dinner or lunch catering for a maximum of 45 guests undercover and is a unique breakout space. Hotel-style room features a mini bar fridge, tea / coffee making facilities and garden views. Hotel-style room features a mini bar fridge, tea / coffee making facilities and balcony with sea views. Located on the absolute ocean front featuring a large balcony, internal spa bath with timber louvers opening into the room, microwave, sink, tea / coffee making facilities and a mini bar fridge. Built on the high watermark on the absolute oceanfront point featuring a king size bed, couple's outdoor balcony spa and double hammock all overlooking magnificent sea views, microwave, sink, tea / coffee making facilities and a mini bar fridge. Located on the absolute oceanfront and featuring a queen size bed, full kitchen, a lounge room and dining room as well a large private balcony with full sea views. Enjoy the comfort of these spacious apartments that feature a fully equipped kitchen, laundry, spacious balcony, open plan lounge and dining area. Experience the luxury located on the top floor, from the outdoor balcony spa directly overlooking the oceanfront. Features include two spacious bathrooms, laundry, a large fully equipped kitchen with stainless steel appliances and granite bench tops, lounge and dining area, DVD, and high speed internet. Ideal for a family holiday without neglecting the need for a little luxury. Features an outdoor balcony spa and outdoor dining table, full kitchen facilities, laundry and open plan dining / living room. Garden views.